Physics MCQ Test Series with solutions (practice questions answers) on “Units, Dimensions, Measurements and Error Analysis” to prepare online for IITJEE, AIPMT, NEET, Medical and Engineering Joint Entrance Exams and other competitive examinations. Syllabus Topics: Units and Dimensions. International System of Units - SI, Fundamental and Derived Units. Dimensional Formulae and Dimensional Equations. Dimensional Analysis and its Applications. Significant figures and rounding off the numbers. Measurement of length, mass, and time. Accuracy, Precision of Instruments and error analysis. Question 21: In which of the following numerical values, all zeroes are significant? Question 24: Which pair do not have equal dimensions? 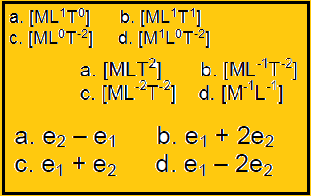 Question 28:The values of two resistors are (5.0 ± 0.2) kΩ and (10.0 ± 0.1) kΩ. What is the percentage error in the equivalent resistance when they are connected in parallel?